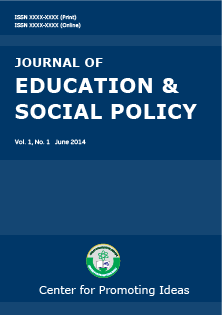 Journal of Education & Social Policy (JESP) is an open access, peer reviewed, and fully refereed international academic journal published by Center for Promoting Ideas (CPI), USA. The main objective of JESP is to provide a platform for the international scholars, academicians and researchers to share the contemporary thoughts in the fields of education and social policies. JBEP aims to promote policy development in education and thus become the leading international journal in education in the world. Education: Elementary Education, Secondary Education, Health Promotion, Minor Education Studies, Special Education, Nutrition Education, Bilingual Education, International Training And Education, Learning Disabilities, Teaching, Peace And Conflict Resolution, Curriculum And Instruction, Experiential Learning, Social Justice And Urban Education, Psychology Of Education, Technology In Education, Gender And Cultural Diversity In School, Comparative And International Education, Cultural Factors In Higher Education, Education And Social Change, Children's Literature, Language And Literacy Learning, Education And Public Policy, Leadership Skills, Classroom Management, Legal Issues In Education, Student Teaching, and so on. Social Policy: Human Rights, Social Work, Social Welfare, Gender, Women’s Studies, Religion, Welfare State, Social Security, Unemployment Insurance, Environmental Policy, Economic Policy, Human Behavior, Pensions, Health Care, Social Housing, Social Care, Child Protection, Social Exclusion, Education Policy, Crime and Criminal Justice and so on. JESP publishes original papers, review papers, conceptual framework, analytical and simulation models, case studies, empirical research, technical notes, and book reviews. Special Issues devoted to important topics in education will occasionally be published.